"MOMAX cam", which allows you to take selfie by gesture*, is now available in App Store & Google Play! To make fun in selfie! With magnificent metal and leather-felt material, Selfie Pro is in simple yet elegant design. Let's selfie in any memorable occasions! The leather-felt hand strap and high-quality bag, together with the Bluetooth shutter and its clip, the accessories bring more extravagance and flexibility. 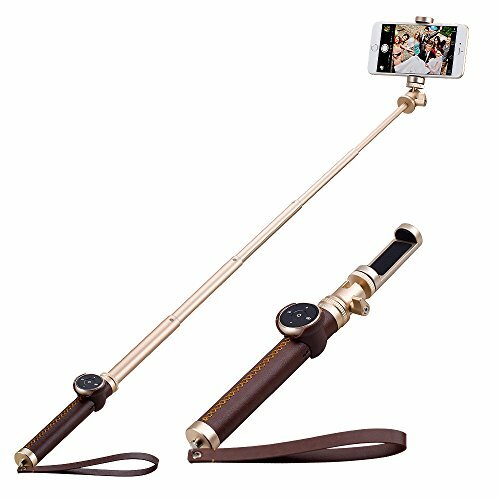 The monopod can extend as long as 20 Inch or 35 Inch, has a phone holder compatible with Smartphone Size between:2.3"-3.1". Simple to use: simply turn on the selfie stick and pair it with your phone via Bluetooth to take photos with the accessible handle button. For the selfie artist - the adjustable holder allows a variety of shooting angles from traditional selfies to above-crowd shots. Fully compatible with most smartphones support Android and IOS 5.0 or above. Package contents: 1pc Momax Selfie Stick, 1pc Remote control, 1pc portable bag, a button battery, 1pc string, and user manual. Multi function Bluetooth remote control: You can use MOMAX cam from a distance of 10M to excute shooting and music control. "MOMAX cam" is available in APP store& google play. 4K shooting partner : The selfie stick can extend to 50cm(20") or 90cm(35") to enjoy photo fun. Craftsmanship: The soft leather-felt material with delicate handcrafted stitch bring perfect sensation and aesthetics, match with metal texture and shows high level design. Intimate details design: Multi angle rotation , same color wristband as the stick leather. And the upper part is a perfect phone bracket. Manufacturer: Momax Technology (HongKong) Ltd. Publisher: Momax Technology (HongKong) Ltd. Studio: Momax Technology (HongKong) Ltd. If you have any questions about this product by MOMAX, contact us by completing and submitting the form below. If you are looking for a specif part number, please include it with your message.